Spur of the moment interview during a lunch meetup with Photographer Brad Crooks. Brad talks about how he has developed a relationship with 150 newspapers across the country worth 6 million readers leading to free travel all over the world. Cutting through the clutter and the thousands of marketing messages to reach your target audience is not so easy any more. David Shenk, in his book “Data Smog: Surviving the Information Glut ” states that in 1971 we were exposed to an average of 560 advertising messages per day. By 1997 that number had grown to over 3,000. Today conservative estimates put it at over ten thousand each and every day. Think about it: Every time you flip through a newspaper or magazine, you encounter hundreds of ads. Add to that everything from TV and radio ads to product placements, billboards, direct mail and postcards, ads on the Internet from every direction (an hour of surfing on the web can easily yield more than a thousand ads), ads on the sides of trucks, vans, signs hung on telephone poles, telemarketing ads, door-to-door salesman, the list goes on. Ken McArthur just spent a solid year researching and mastering the problem of how to get your ideas, products and services noticed, and make sure that people spread your message to the masses so that you can have a personal impact in a world that doesn’t always want to pay attention. Ken shares exactly what he discovered in his new book “Impact: How to Get Noticed, Motivate Millions and Make a Difference in a Noisy World“. Ken’s book is for small business owners, CEOs and nonprofit champions who are on a mission to reach the masses. With the book launch, Ken is handing out thousands of dollars worth of bonuses and no-cost tickets to live events to anyone who orders his book. And even if you don’t want the book, you can still benefit. Ken is also kicking off a coaching program to help others make an impact in the world. With that, he is giving away training from over thirty successful business owners with all kinds of specialties to help you succeed in business. It’s available free at The Impact Factor. One of the greatest benefits of engaging in social media tools, like Facebook and Twitter, is meeting and developing relationships with outstanding people you wouldn’t otherwise have an opportunity to meet. And one of the most exceptional people I have been privileged to get to know is Dr. Mani Sivasubramanian. Dr. Mani is heart surgeon who is using his internet marketing business to fund heart surgery for under-privileged children in India. He is definitely making an impact. As part of his efforts, he has established the Dr.Mani Children Heart Foundation, runs an annual 24-hour blogathon, and hosts A Day for Hearts each February 14th, all to raise awareness about Congenital Heart Defects. These activities are also geared to raise funds to sponsor life-saving heart surgeries for children from poor families suffering from congenital heart disease. With his network of blogs and websites Dr. Mani is an energetic social entrepreneur, philanthropist and teacher. He is a firm believer in the concept of ‘business with “purpose”, Dr.Mani ties in every element of his online work with his passion to help provide expensive, life-saving treatment to poor children in India born with congenital heart defects. I asked him to share his purpose, vision and mission, how that is helping him to have impact, and offer some guidance on how others can have impact. What do you feel is your purpose in life? What is it that you have been put on earth to do? What is your passion, or the heart behind what motivates you? What do you feel it is that that really gets you going with contagious excitement and enthusiasm? I am indeed a firm believer in having a purpose and working towards it. I define ‘purpose’ as being bigger and longer-term than a goal or target which can be hit or reached. A purpose evolves over time, gets bigger, reaches further, and in a sense, is never quite ‘finished’ or ‘achieved’… only ‘progressed towards’. My skill-set when I started dabbling in online marketing was limited to heart surgery, where I specialized in treating birth defects in children. The unfortunate reality is that most Indian families needing treatment for their child’s heart birth defects cannot afford the steep costs involved. That led me to explore other options to raise funds to make treatment possible. So in a way my ‘purpose’ was driven by ‘need’ – and is in alignment with my lifelong dream of treating heart defects. It is what I’m most passionate about, have been since I was around 14 years old. Working towards that dream, overcoming hurdles and getting past obstacles, persisting and sticking on when the going gets tough, all the while staying focused on the bigger picture of what I’d love to see happen is what keeps me excited and enthused. My purpose, in that sense, is to ensure that every Indian child has access to affordable, high quality heart healthcare. Everything I do is a step towards achieving that purpose, or at least, getting closer to that ideal. Where are you going with your purpose, what’s the best case, ideal end result you are looking for? What do you see that others need to see? What insight, solution to the problems, or vantage point do you have that others could benefit from? How are you leading others toward that vision? Even my intermediate vision is pretty ambitious, but having found some initial success with what started out as an ‘impossible’ wish, I am a lot more confident now about making it come true than even 5 years ago. Within the next 3 years, I hope to be able to fund 300 heart surgeries for children every year through a combination of charitable donations and business profits contributed to the Dr.Mani Children Heart Foundation. To this end, I am streamlining many initiatives already underway, and planning/creating some more with the help of a growing network of supporters and volunteers that in time will make this a reality. The approaches I’m trying are neither simple, nor guaranteed. But because I am convinced that by trying it out, I will be able to give a few families and children a chance at receiving treatment that they would otherwise not be able to, I stay motivated and energized about these attempts. My biggest challenge is to get others involved and engaged – not intellectually but emotionally – in the problems faced by parents of kids with CHD (congenital heart defects). Once that is done, the kind of support that is showered on the project is unbelievable. So a lot of my efforts are spent to trying to showcase this situation to the right audience, while also pointing out how they can be a part of the solution. How do you carry out your purpose practically? What do you do that gets massive results? What action have you taken that practically demonstrates your ability to accomplish great things? Initially, everything I did was ‘trial and error’ experimentation. I made many mistakes, wasted many hours and effort going after methods that didn’t work well. But everything was educational, and now I have a set of methods that work well in raising awareness, bringing in cash donations and attracting more volunteers to participate. A lot of my work in spreading awareness and raising funds has been on the Internet. And to support this effort, a lot of things need to be done offline too, especially related to facilitating the process of transferring funds raised through drives and events into India where they can be used in performing operations. The paperwork and legal procedures to go through are intense and extensive… yet necessary. But much of the hard work has paid off. The Dr.Mani Children Heart Foundation has sponsored 23 operations until now, and has funds to sponsor another 15 more. Better still, we now have an established donor base that will very likely fund many more operations in the future. And as our profile grows and track record becomes more meaty, I’m finding that many more people gravitate towards this work we are doing, and offering to help in one way or another. All this gives me hope that the next few years will see far speedier growth and expansion than the previous ones. 4. How have these factors allowed you to have IMPACT in and on the world around you? In a deeper sense than I could ever have imagined, my life has become infinitely more satisfying, and even impactful on others, after I chose to start giving to others. Far more people buy my digital products online because of what the profits will help achieve than they might have done purely for the quality or value they no doubt receive. I mentioned this in an interview FAST COMPANY magazine did with me a year back. Whenever I run a special offer or promotion to my mailing list and mention that the proceeds will go to charity, my ‘response rates’ DOUBLE or better! And many top experts in different fields have heard about my work, offered to help and introduced me to their audiences purely because of the work I do with my ‘heart kids’. If I had been ‘just another infopreneur’, I doubt if any of them would have given me the time of the day! And on a different note, I get email on a weekly basis from many others who follow me on blogs, forums and ezines, saying how they found what I’m doing inspiring enough to try and emulate this approach in their business, to support a charity or cause they care about. So there’s a ripple effect that goes far beyond my own small efforts, and that touches many more lives in many wondrous ways. I’m delighted and excited about that, and it is one of the reasons I go against my natural shyness and reticence in ‘tooting my own horn’ to tell others about the things the Internet has allowed me to do. 5. What advice would you have for others who want to have impact; to make a profit AND make a difference? And don’t let anyone tell you it “will not work”. Trust me, it will. If you want it to work. And are willing to put in the effort to make it happen. To do that, to stick through the hassles and setbacks, you’ll need a strong motivation. Your passion will be that motivator. It’s the spark that sets off the fuel of purpose and creates a roaring fire that will warm the hearts of people who come into contact with you – and encourage them to come closer, get involved and join your effort to make a difference. I wrote a short ebook titled “How To Cross The Road” that’s been read by over 5,000 people. It’s a parable that uses the example of an everyday act like crossing the road, but turns it into a guide to taking your chance, doing things that you’ve always wanted to, grabbing your opportunity to change the world. Read it. Cross your road. Make a difference. Good luck, and I wish you all success. 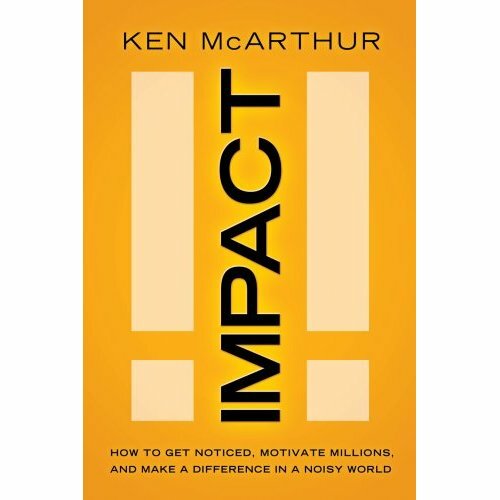 If you want more help to make and impact in your world, remember that next Tuesday, May 13th, Ken McArthur is releasing “Impact: How to Get Noticed, Motivate Millions and Make a Difference in a Noisy World“. To build awareness of his new book, Ken is also giving away training from over thirty successful business owners with all kinds of specialties to help you succeed in business. It’s available free at The Impact Factor. Can a Mission Statement Help you have Impact? How does having, or not having a mission statement contribute to an organization’s ability to have impact? Is merely having a mission statement enough? In this video post, I take a look at what mission really is and how to effectively accomplish your mission. I like “Be an Outsider” because it says something about the nature of the organization, while at the same time communicates a passion, a vision and an action – encourage and motivate others to get out and enjoy the great outdoors. Short and to the point, it does the job. The one from Geoff Livingston “Works Well” is also short, but it takes a little more info to get to the heart of the matter. Jeff runs a PR/marketing communications firm where the mission is more fully stated as, ” Our mission is to develop and execute superior outreach campaigns that deliver results, plain and simple.” He also had a recent blog post on Strategy that spelled out in more detail what his company’s approach is to communications. My comments there reiterate the same thought here – there’s got to something more in back of your mission statement than just the words. Do you, or does your company have a mission statement? Do you feel like you are having impact? I would love to hear your comments. Also, don’t forget that next Tuesday, May 13th, Ken McArthur is releasing “Impact: How to Get Noticed, Motivate Millions and Make a Difference in a Noisy World“. To build awareness of his new book, Ken is giving away training from over thirty successful business owners with all kinds of specialties to help you succeed in business. It’s available free at The Impact Factor. Just something fun – a Sunday afternoon hike with the family. What does it take to have impact? How do you know you are having impact? How do you define what it even means to have impact? Over the next couple of weeks, I’m going to consider what effect having a clearly defined purpose, vision and mission has on making an impact. What does it mean to have a purpose, a vision and a mission, and how does that enable you to have impact? This consideration comes on the front end of a book launch of a friend of mine named Ken McArthur. On May 13th, Ken has a new book coming out called “Impact: How to Get Noticed, Motivate Millions and Make a Difference in a Noisy World“. The book will delve into stories of ordinary people who have left their marks on the world and the simple actions you can implement to ensure you make an impact on your world as well. Ken is also launching a coaching program and to build awareness of that and his new book, he is giving away over 100 hours of audio training from over thirty of his hand-picked personal advisers and colleagues across a spectrum of business specialties. It’s free at The Impact Factor. I’m looking forward to exploring this theme with you and to your comments.